This guide provides tips for improving server and database performance. This article provides some procedures and options that administrators can use to optimize the performance of their Red Hat Directory Server deployments. Performance tuning a Directory Server instance is unique to each server because of differences for every server in its machine environment, directory size and data type, load and network use, even the types of operations that users and clients perform. The purpose of this article is to highlight the features that Red Hat Directory Server provides for tracking and assessing server and database performance. There are also some procedures given to help tune server performance. For more in-depth planning information, however, check out the Red Hat Directory Server Deployment Guide, and for exhaustive command-line and UI-based administrative instructions, see the Red Hat Directory Server Administration Guide. Performance tuning is simply a way to identify potential (or real) bottlenecks in the normal operating environment of the server and then taking steps to mitigate those bottlenecks. Assess the environment. Look at everything around the Directory Server: its usage, the load, the network connection and reliability, most common operations, the physical machine its on, along with any services competing for its resources. Measure the current Directory Server performance and establish baselines. Identify the server areas which can be improved. Make any changes to the Directory Server settings and, potentially, to the host machine. Measure the Directory Server performance again to see how the changes affected the performance. These changes relate much more to planning an effective Directory Server deployment than changes that can be made to an instance. Reviewing the Deployment Guide can provide more detail about how to plan an optimal enterprise deployment. Red Hat Directory Server has two methods of recording and tracking performance data: performance counters and logs. Counters are used to determine how well the Directory Server performing, particularly in database performance; logs are used to diagnose any problem areas with server and LDAP operations and configuration. Performance counters focus on the operations and information of the Directory Server for the server, all configured databases, and database links (chaining databases). There are three types of logs: access (for client connections), errors (for errors, warnings, and details of events), and audit (changes to Directory Server configuration). The access and error logs run by default (and the errors log is required for the server to run). Audit logging, because of the overhead, must be enabled manually. The access log is buffered. This allows full access logging even with highly loaded servers, but there is a time lag between when the event occurs in the server and when the event is written to the log. The Directory Server's current activities can be monitored from either the Directory Server Console or the command line. It is also possible to monitor the activity of the caches for all of the database. Some of the counters for Directory Server database attributes monitored by server use 64-bit integers, even on 32-bit systems (total connections, operations initiated, operations completed, entries sent, and bytes sent). On high-volume systems, this keeps the counters from rolling too quickly and skewing monitoring data. In the Directory Server Console, select the Status tab. In the navigation tree, select Performance Counters. The Status tab in the right pane displays current information about server activity. If the server is currently not running, this tab will not provide performance monitoring information. The General Information table shows basic information about the server, which helps set a baseline about the statistics that have been gathered. Server Version Identifies the current server version. Startup Time on Server The date and time the server was started. Current Time on Server The current date and time on the server. The Resource Summary table shows the totals of all operations performed by that instance. Connections The total number of connections to this server since server startup. Average number of connections per minute since server startup. Operations Initiated The total number of operations initiated since server startup. Operations include any client requests for server action,such as searches, adds, and modifies. Often, multiple operations are initiated for each connection. Average number of operations per minute since server startup. Operations Completed The total number of operations completed by the server since server startup. Average number of operations per minute since server startup. Entries Sent to Clients The total number of entries sent to clients since server startup. Entries are sent to clients as the result of search requests. Average number of entries sent to clients per minute since server startup. Bytes Sent to Clients The total number of bytes sent to clients since server startup. Average number of bytes sent to clients per minute since server startup. The Current Resource Usage table shows the current demands on the server. Active Threads The current number of active threads used for handling requests. Additional threads may be created by internal server tasks, such as replication or chaining. Open Connections The total number of open connections. Each connection can account for multiple operations, and therefore multiple threads. Remaining Available Connections The total number of remaining connections that the server can concurrently open. This number is based on the number of currently open connections and the total number of concurrent connections that the server is allowed to open. In most cases, the latter value is determined by the operating system and is expressed as the number of file descriptors available to a task. Threads Waiting to Write to Client The total number of threads waiting to write to the client. Threads may not be immediately written when the server must pause while sending data to a client. Reasons for a pause include a slow network, a slow client, or an extremely large amount of information being sent to the client. Threads Waiting to Read from Client The total number of threads waiting to read from the client. Threads may not be immediately read if the server starts to receive a request from the client, and then the transmission of that request is halted for some reason. Generally, threads waiting to read are an indication of a slow network or client. Databases in Use The total number of databases being serviced by the server. The Connection Status table simply lists the current active connections, with related connection information. Time Opened The time on the server when the connection was initially opened. Started The number of operations initiated by this connection. Completed The number of operations completed by the server for this connection. Bound as The distinguished name used by the client to bind to the server. If the client has not authenticated to the server, the server displays not bound in this field. Not blocked means that the server is idle,actively sending data to the client, or actively reading data from the client. Blocked means that the server is trying to send data to the client or read data from the client but cannot. The probable cause is a slow network or client. The Global Database Cache table lists the cache information for all databases within the Directory Server instance. 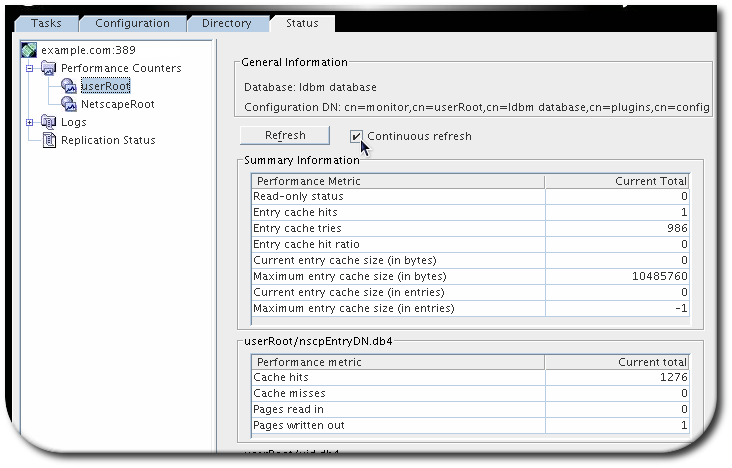 Although the performance counter for the global database cache is listed with the other server performance counters in the Directory Server Console, the actual database cache entries are located and monitored in cn=monitor,cn=database_instance,cn=ldbm database,cn=plugins,cn=config, as are the other database activities. Hits The number of times the server could process a request by obtaining data from the cache rather than by going to the disk. Tries The total number of database accesses since server startup. Hit Ratio The ratio of cache tries to successful cache hits. The closer this number is to 100%, the better. Pages Read In The number of pages read from disk into the cache. Pages Written Out The number of pages written from the cache back to disk. Read-Only Page Evicts The number of read-only pages discarded from the cache to make room for new pages. Pages discarded from the cache have to be written to disk, possibly affecting server performance. The lower the number of page evicts the better. Read-Write Page Evicts The number of read-write pages discarded from the cache to make room for new pages. This value differs from Pages Written Out in that these are discarded read-write pages that have not been modified. Pages discarded from the cache have to be written to disk, possibly affecting server performance. The lower the number of page evicts, the better. Search with the attribute filter objectClass=*. Use the search base cn=monitor; the monitoring attributes for the server are found in the cn=monitor entry. Use the search scope base. # ldapsearch -D "cn=Directory Manager" -W -p 389 -h server.example.com -x -s base -b "cn=monitor" "(objectclass=*)"
The monitoring attributes for the Directory Server are found in the cn=monitor entry. version Identifies the directory's current version number. threads The current number of active threads used for handling requests. Additional threads may be created by internal server tasks, such as replication or chaining. fd — The file descriptor used for this connection. opentime — The time this connection was opened. opsinitiated — The number of operations initiated by this connection. opscompleted — The number of operations completed. binddn — The distinguished name used by this connection to connect to the directory. rw — The field shown if the connection is blocked for read or write. By default, this information is available to Directory Manager. However, the ACI associated with this information can be edited to allow others to access the information. currentconnections Identifies the number of connections currently in service by the directory. totalconnections Identifies the number of connections handled by the directory since it started. dtablesize Shows the number of file descriptors available to the directory. Each connection requires one file descriptor: one for every open index, one for log file management, and one for ns-slapd itself. Essentially, this value shows how many additional condncurrent connections can be serviced by the directory. For more information on file descriptors, see the operating system documentation. readwaiters Identifies the number of threads waiting to read data from a client. opsinitiated Identifies the number of operations the server has initiated since it started. opscompleted Identifies the number of operations the server has completed since it started. entriessent Identifies the number of entries sent to clients since the server started. bytessent Identifies the number of bytes sent to clients since the server started. currenttime Identifies the time when this snapshot of the server was taken. The time is displayed in Greenwich Mean Time (GMT) in UTC format. starttime Identifies the time when the server started. The time is displayed in Greenwich Mean Time (GMT) in UTC format. nbackends Identifies the number of back ends (databases) the server services. backendmonitordn Identifies the DN of each directory database. Some of the counters for Directory Server database attributes monitored by server use 64-bit integers, even on 32-bit systems (entry cache hits, entry cache tries, the current cache size, and the maximum cache size). On high-volume systems, this keeps the counters from rolling too quickly and skewing monitoring data. In the navigation tree, expand the Performance Counters folder, and select the database to monitor. The tab displays current information about database activity. If the server is currently not running, this tab will not provide performance monitoring information. The Summary Information section shows the cumulative information for all of the databases being monitored and some cache-related configuration settings which are applied to all databases. Read-Only Status Shows whether the database is currently in read-only mode. The database is in read-only mode when the nsslapd-readonly attribute is set to on. Entry Cache Hits The total number of successful entry cache lookups. That is, the total number of times the server could process a search request by obtaining data from the cache rather than by going to disk. Entry Cache Tries The total number of entry cache lookups since the directory was last started. That is, the total number of entries requested since server startup. Ratio that indicates the number of entry cache tries to successful entry cache lookups. This number is based on the total lookups and hits since the directory was last started. The closer this value is to 100%, the better. Whenever an operation attempts to find an entry that is not present in the entry cache, the directory has to perform a disk access to obtain the entry. Thus, as this ratio drops towards zero, the number of disk accesses increases, and directory search performance drops. To improve this ratio, increase the size of the entry cache by increasing the value of the nsslapd-cachememsize attribute in the cn=database_name, cn=ldbm database,cn=plugins,cn=config entry for the database. In the Directory Server Console, this is set in the Memory available for cache field in the database settings. Current Entry Cache Size (in Bytes) The total size of directory entries currently present in the entry cache. The size of the entry cache maintained by the directory. This value is managed by the nsslapd-cachememsize attribute in the cn=database_name, cn=ldbm database,cn=plugins,cn=config entry for the database. This is set in the Memory available for cache field in the database settings in the Directory Server Console. Current Entry Cache Size (in Entries) The number of directory entries currently present in the entry cache. The maximum number of directory entries that can be maintained in the entry cache. Do not attempt to manage the cache size by setting a maximum number of allowed entries. This can make it difficult for the host to allocate RAM effectively. Manage the cache size by setting the amount of RAM available to the cache, using the nsslapd-cachememsize attribute. There are many different databases listed for the database monitoring page, by default, because databases are maintained for both entries and indexed attributes. All databases, though, have the same kind of cache information monitored in the counters. Hits The number of times the database cache successfully supplied a requested page. Tries The number of times the database cache was asked for a page. The ratio of database cache hits to database cache tries. The closer this value is to 100%, the better. Whenever a directory operation attempts to find a portion of the database that is not present in the database cache, the directory has to perform a disk access to obtain the appropriate database page. Thus, as this ratio drops towards zero, the number of disk accesses increases, and directory performance drops. To improve this ratio, increase the amount of data that the directory maintains in the database cache by increasing the value of the nsslapd-dbcachesize attribute. This is the Maximum Cache Size database setting in the Directory Server Console. Pages Read In The number of pages read from disk into the database cache. Pages Written Out The number of pages written from the cache back to disk. A database page is written to disk whenever a read-write page has been modified and then subsequently deleted from the cache. Pages are deleted from the database cache when the cache is full and a directory operation requires a database page that is not currently stored in cache. Read-Only Page Evicts The number of read-only pages discarded from the cache to make room for new pages. Read-Write Page Evicts The number of read-write pages discarded from the cache to make room for new pages. This value differs from Pages Written Out in that these are discarded read-write pages that have not been modified. Cache Hits The number of times that a search result resulted in a cache hit on this specific file. That is, a client performs a search that requires data from this file, and the directory obtains the required data from the cache. Cache Misses The number of times that a search result failed to hit the cache on this specific file. That is, a search that required data from this file was performed, and the required data could not be found in the cache. Pages Read In The number of pages brought to the cache from this file. Pages Written Out The number of pages for this file written from cache to disk. A database's current activities can be monitored using LDAP tools such as ldapsearch. The search targets the monitoring subtree of the LDBM database entry, cn=monitor,cn=database_name,cn=ldbm database,cn=plugins,cn=config. This contains all of the monitoring attributes for the that specific database instance. # ldapsearch -D "cn=Directory Manager" -W -p 389 -h server.example.com -x -s base -b "cn=monitor,cn=database_name,cn=ldbm database,cn=plugins,cn=config" "(objectclass=*)"
database Identifies the type of database currently being monitored. readonly Indicates whether the database is in read-only mode; 0 means that the server is not in read-only mode, 1 means that it is in read-only mode. entrycachehits The total number of successful entry cache lookups. That is, the total number of times the server could process a search request by obtaining data from the cache rather than by going to disk. entrycachetries The total number of entry cache lookups since the directory was last started. That is, the total number of search operations performed against the server since server startup. Ratio that indicates the number of entry cache tries to successful entry cache lookups. This number is based on the total lookups and hits since the directory was last started. The closer this value is to 100%, the better. Whenever a search operation attempts to find an entry that is not present in the entry cache, the directory has to perform a disk access to obtain the entry. Thus, as this ratio drops towards zero, the number of disk accesses increases, and directory search performance drops. The total size, in bytes, of directory entries currently present in the entry cache. To increase the size of the entries which can be present in the cache, increase the value of the nsslapd-cachememsize attribute in the cn=database_name, cn=ldbm database,cn=plugins,cn=config entry for the database. In the Directory Server Console, this is set in the Memory available for cache field in the database settings. The maximum size, in bytes, of directory entries that can be maintained in the entry cache. dbcachehits The number of times the server could process a request by obtaining data from the cache rather than by going to the disk. dbcachetries The total number of database accesses since server startup. dbcachehitratio The ratio of cache tries to successful cache hits. The closer this number is to 100%, the better. dbcachepagein The number of pages read from disk into the cache. dbcachepageout The number of pages written from the cache back to disk. dbcacheroevict The number of read-only pages discarded from the cache to make room for new pages. Pages discarded from the cache have to be written to disk, possibly affecting server performance. The lower the number of page evicts the better. dbcacherwevict The number of read-write pages discarded from the cache to make room for new pages. This value differs from Pages Written Out in that these are discarded read-write pages that have not been modified. Pages discarded from the cache have to be written to disk, possibly affecting server performance. The lower the number of page evicts the better. dbfilename-number The name of the file. number provides a sequential integer identifier (starting at 0) for the file. All associated statistics for the file are given this same numerical identifier. dbfilecachehit-number The number of times that a search result resulted in a cache hit on this specific file. That is, a client performs a search that requires data from this file, and the directory obtains the required data from the cache. dbfilecachemiss-number The number of times that a search result failed to hit the cache on this specific file. That is, a search that required data from this file was performed, and the required data could not be found in the cache. dbfilepagein-number The number of pages brought to the cache from this file. dbfilepageout-number The number of pages for this file written from cache to disk. The total size, in bytes, of DNs currently present in the DN cache. To increase the size of the entries which can be present in the DN cache, increase the value of the nsslapd-dncachememsize attribute in the cn=database_name, cn=ldbm database,cn=plugins,cn=config entry for the database. The maximum size, in bytes, of DNs that can be maintained in the DN cache. To increase the size of the entries which can be present in the cache, increase the value of the nsslapd-dncachememsize attribute in the cn=database_name, cn=ldbm database,cn=plugins,cn=config entry for the database. currentdncachecount The number of DNs currently present in the DN cache. 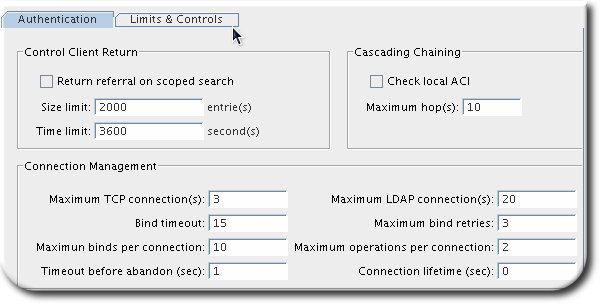 The activity for database links (chained databases) can also be viewed, but only through the command line using ldapsearch to return the monitoring attributes that are required. The monitoring attributes are stored in the cn=monitor,cn=database_link_name,cn=chaining database,cn=plugins,cn=config. nsAddCount The number of add operations received. nsDeleteCount The number of delete operations received. nsModifyCount The number of modify operations received. nsRenameCount The number of rename operations received. nsSearchBaseCount The number of base-level searches received. nsSearchOneLevelCount The number of one-level searches received. nsSearchSubtreeCount The number of subtree searches received. nsAbandonCount The number of abandon operations received. nsBindCount The number of bind request received. nsUnbindCount The number of unbinds received. nsCompareCount The number of compare operations received. nsOperationConnectionCount The number of open connections for normal operations. nsBindConnectionCount The number of open connections for bind operations. When the disk space available on a system becomes too small, the Directory Server process (slapd) crashes. Any abrupt shutdown runs the risk of corrupting the database or losing directory data. It is possible to monitor the disk space available to the slapd process. A disk monitoring thread is enabled using the nsslapd-disk-monitoring configuration attribute. This creates a monitoring thread that wakes every ten (10) seconds to check for available disk space in certain areas. Access logging and error logging are disabled. Rotated (archived) logs are deleted. Error log messages are always recorded, even when other changes are made to the logging configuration. If the available disk space continues to drop to half of the configured threshold, then the slapd begins a graceful shut down process (within a grace period); and if the available disk space ever drops to 4KB, then the slapd process shuts down immediately. If the disk space is freed up, then the shutdown process is aborted, and all of the previously disabled log settings are re-enabled. By default, the monitoring thread checks the configuration, transaction log, and database directories. An additional attribute (nsslapd-disk-monitoring-logging-critical) can be set to include the logs directory when evaluating disk space. Disk monitoring is disabled by default, but it can be enabled and configured by adding the appropriate configuration attributes to the cn=config entry. Table 2.12, “Disk Monitoring Configuration Attributes” lists all of the configuration options. Using ldapmodify, add the disk monitoring attributes. At a minimum, turn on the nsslapd-disk-monitoring attribute to enable disk monitoring. The default threshold is 2MB; this can be configured (optionally) in the nsslapd-disk-monitoring-threshold attribute. Restart the Directory Server to load the new configuration. nsslapd-disk-monitoring Enabled disk monitoring. This is the only required attribute, since the other configuration options have usable defaults. nsslapd-disk-monitoring-grace-period Sets a grace period to wait before shutting down the server after it hits half of the disk space limit. This gives an administrator time to address the situation. The default value is 60 (minutes). nsslapd-disk-monitoring-logging-critical Sets whether to shut down the server if the log directories pass the halfway point set in the disk space limit.This prevents the monitoring thread from disabling audit or access logging or from deleting rotated logfiles. nsslapd-disk-monitoring-threshold Sets the amount of disk space, in bytes, to use to evaluate whether the server has enough available disk space. Once the space reaches half of this threshold, then the server begins a shut down process. The default value is 2000000 (2MB). The access and error logs are enabled by default and can be viewed immediately. before the audit log can be viewed, audit logging must be enabled for the directory, or the audit log will not be kept. In the navigation tree, expand the Log folder. There are three folders available, for the access, error, and audit logs. When you select the log type to view, a table displays a list of the last 25 entries in the selected log. Optionally, change the settings of the log display and click Refresh to update the display. The Select Log pull-down menu allows you to select an archived (rotated) log rather than the currently active log. The Lines to show text box changes the number of log entries to display in the window. The Show only lines containing text box sets a filter, including regular expressions, to use to display only certain matching log entries. Selecting the Continuous check box refreshes the log display automatically every ten seconds.= Continuous log refresh does not work well with log files over 10 megabytes. More detailed usage information is in the Configuration, Command, and File Reference. However, while that has the advantage of being simple to implement and not requiring any Directory Server configuration changes, simply running the script has a big disadvantage: all of the log viewers in the Directory Server Console and any script or tool (such as logconv.pl) that expect to access a real file will fail. If the Directory Server instance will permanently use the named pipe rather than a real file for logging, then it is possible to reconfigure the instance to create the named pipe and use it for logging (as it does by default for the log files). When the Directory Server instance is configured to use the named pipe then all of the log analysis tools — the Directory Server Console and any Directory Server scripts — work fine. These configuration changes can be made in the Directory Server Console or using ldapmodify. Making these changes using the -f option will cause the server to close the current log file and switch to the named pipe immediately. This can be very helpful for debugging a running server and sifting the log output for specific messages. Larger server deployments can generate several dozen of megabytes of logs per hour. Depending on the resources available on the server host machine, reconfiguring or disabling access logging can improve system and Directory Server performance. Before disabling access logging, first configure access log buffering. Buffering writes all log entries directly to the disk, so that the Directory Server performance does not degrade even under a heavy load. The access log is buffered by default, but make sure the log is using buffering for best performance. If that does not improve performance, then disable access logging entirely. Access logging is extremely helpful for debugging issues in the server and monitoring client connections and failed connection attempts. Don't disable access logging as the normal operating environment. For alternatives, see Section 2.6, “Replacing Log Files with a Named Pipe”, since using named pipe log scripts can improve performance while still logging information on high performance production servers. Lock mechanisms in Directory Server control how many copies of Directory Server processes can run at the same time. For example, during an import job, Directory Server sets a lock in the /run/lock/dirsrv/slapd-instance_name/imports/ directory to prevent ns-slapd (Directory Server), ldif2db (another import), or db2ldif (export) operations from running. -s sub -b "cn=database,cn=monitor,cn=ldbm database,cn=plugins,cn=config"
For details about the monitoring attributes, see the descriptions in the Directory Server Configuration, Command, and File Reference. If error messages indicate that the lock table is out of available locks, double the value set in the nsslapd-db-locks parameter in the cn=config,cn=ldbm database,cn=plugins,cn=config entry. If the problem persists, double the value again. For details about nsslapd-db-locks, see the parameter's description in the Directory Server Configuration, Command, and File Reference. The most effective way to improve search operations against the directory is to configure thorough indexes for entries, combined with reasonable limits on search results. Presence index (pres) simply shows what entries contain an attribute. Equality index (eq) shows which attribute values match a specific search string. Approximate index (approx) is used for efficient sounds-like searches, which shows entries which have a value that phonetically matches a string. International index uses a matching rule to match strings in a directory which contains values in languages other than English. Browsing index, or virtual list view (VLV) index, sets an index to use to display entries in the Directory Server Console. Indexing is described in much more detail in the Administration Guide. The Directory Server receives an add or modify operation. The Directory Server examines the indexing attributes to determine whether an index is maintained for the attribute values. If the created attribute values are indexed, then the Directory Server generates the new index entries. Once the server completes the indexing, the actual attribute values are created according to the client request. description: Manufacturing lead for the Z238 line of widgets. Equality, approximate, and substring indexes for cn (common name) and sn (surname) attributes. Equality and substring indexes for the telephone number attribute. Substring indexes for the description attribute. Create the cn equality index entry for John and John Doe. Create the appropriate cn approximate index entries for John and John Doe. Create the appropriate cn substring index entries for John and John Doe. Create the sn equality index entry for Doe. Create the appropriate sn approximate index entry for Doe. Create the appropriate sn substring index entries for Doe. Create the telephone number equality index entry for 408 555 8834. Create the appropriate telephone number substring index entries for 408 555 8834. Create the appropriate description substring index entries for Manufacturing lead for the Z238 line of widgets. A large number of substring entries are generated for this string. Before creating new indexes, make sure to balance the overhead of maintaining the indexes against the potential improvements in search performance. Especially important, match the types of indexes that you maintain to the type of information stored in the directory and the type of information users routinely search for. Approximate indexes are not efficient for attributes commonly containing numbers, such as telephone numbers. Substring indexes do not work for binary attributes. Equality indexes should be avoided if the value is big (such as attributes intended to contain photographs or passwords containing encrypted data). Maintaining indexes for attributes not commonly used in a search increases overhead without improving global searching performance. Attributes that are not indexed can still be specified in search requests, although the search performance may be degraded significantly, depending on the type of search. The more indexes you maintain, the more disk space you require. Creating indexes is much more effective for directories which have a high search operation load and low modify operation load. The maximum number of entries the server returns to the client in response to a search operation (size limit attribute). The maximum amount of real time (in seconds) for the server to spend performing a search request (time limit attribute). The time (in seconds) during which the server maintains an idle connection before terminating it (idle timeout attribute). The maximum number of file descriptors available to the Directory Server (max number of file descriptors attribute). In the Directory Server Console, select the Configuration tab, and then select the topmost entry in the navigation tree in the left pane. Select the Performance tab in the right pane. Set the maximum number of entries the server will return to the client in response to a search operation by entering a new value in the Size Limit text box. To keep from setting a limit, type -1 in this text box. Enter the maximum amount of real time (in seconds) for the server to spend performing a search request in the Time Limit text box. Enter the time (in seconds) for the server to maintain an idle connection before terminating it in the Idle Timeout text box. To keep from setting a limit, type zero (0) in this text box. Set the maximum number of file descriptors available to the Directory Server in the Max Number of File Descriptors text box. For more information on this parameter, see the Red Hat Directory Server Configuration, Command, and File Reference. In large directories, the search results list can get huge. A directory with a million inetorgperson entries would have a million entries that were returned with a filter like (objectclass=inetorgperson), and an index for the sn attribute would have at least a million entries in it. Loading a long ID list from the database significantly reduces search performance. The configuration parameter, nsslapd-idlistscanlimit, sets a limit on the number of IDs that are read before a key is considered to match the entire primary index (meaning the search is treated as an unindexed search with a different set of resource limits). For large indexes, it is actually more efficient to treat any search which matches the index as an unindexed search. The search operation only has to look in one place to process results (the entire directory) rather than searching through an index that is nearly the size of a directory, plus the directory itself. The default value of the nsslapd-idlistscanlimit attribute is 4000, which is gives good performance for a common range of database sizes and access patterns. It's usually not necessary to change this value. If the database index is slightly larger than the 4000 entries, but still significantly smaller than the overall directory, then raising the scan limit improves searches which would otherwise hit the default limit of 4000. On the other hand, lowering the limit can significantly speed up searches that would otherwise hit the 4000 entry limit, but where it is not necessary to scan every entry. In large databases, some queries can consume a large amount of CPU and RAM resources. To improve the performance, you can set a default ID scan limit that applies to all indexes in the database using the nsslapd-idlistscanlimit attribute. However in some cases it is useful to define a limit for certain indexes, or use no ID list. You can set individual settings for ID list scan limits for different types of search filters using the nsIndexIDListScanLimit attribute. To set a limit, for example for the objectClass attribute, add the nsIndexIDListScanLimit parameter to the DN cn=objectclass,cn=index,cn=userRoot,cn=ldbm database,cn=plugins,cn=config. 0: Do not use the index. 1 to the maximum 32-bit integer (2147483647): Maximum number of IDs. type: Optional. The type of the index. eq, sub, pres, and so on. The value must be one of the actual nsIndexType specified for the index definition. For example, you cannot use type=eq if you do not have nsIndexType=eq defined. AND: Apply the scan limit only to searches in which the attribute appears in an AND clause. OR: Apply the scan limit only to searches in which the attribute appears in an OR clause. values: Optional. Comma separated list of values which must match the search filter in order for the limit to be applied. Since the matches are done one at a time, the values will match if any of the values matches. The values must be used with only one type at a time. The values must correspond to the index type, and must correspond to the syntax of the attribute to which the index is applied. For example, if you specified the integer based attribute uidNumber and it is indexed for eq, you cannot use type=eq values=abc. If the value contains spaces, commas, NULL, or other values which require to be escaped, the LDAP filter escape syntax should be used: backslash (\) followed by the 2 hex digit code for the character. In the following example, the commas in the DN value are escaped with \2C. In a large database with 10 million entries that contain the object class inetOrgPerson, a search for (&(objectClass=inetOrgPerson)(uid=user)) creates first an ID list containing all 10 million IDs matching objectClass=inetOrgPerson. When the database applies the second part of the filter, it searches the result list for objects matching uid=user. In this cases it is useful to define a limit for certain indexes, or use no ID list at all. No ID list is created for objectClass=inetOrgPerson when used in an AND clause. In all other situations the value of nsslapd-idlistscanlimit is applied. The database attributes that affect search performance mainly define the amount of memory available to the server. The maximum values that can be set for the database's cache size attributes depends on the amount of real memory on the machine. Roughly, the amount of available memory on the machine should always be greater than sum total of the default database cache size and sum of each entry cache size. Use caution when changing these cache sizing attributes. The ability to improve server performance with these attributes depends on the size of the database, the amount of physical memory available on the machine, and whether directory searches are random (that is, if the directory clients are searching for random and widely scattered directory data). If the database does not fit into memory and if searches are random, attempting to increase the values set on these attributes does not help directory performance. In fact, changing these attributes may harm overall performance. 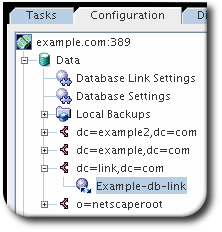 The attributes of each database used to store directory data, including the server configuration data in the NetscapeRoot database, can be resized. To improve the cache hit ratio on search operations, increase the amount of data that the Directory Server maintains in the database cache, as described in Section 6.5, “Setting the Database Cache Size”, by editing the values for the nsslapd-dbcachesize attribute. The amount of memory to make available for all databases (maximum cache size), which is described in Section 6.3, “Setting the Entry Cache Size”. The maximum number of entries for the server to verify in response to a search request (look-through limit). The amount of memory to make available for import (import cache size). In the Directory Server Console, select the Configuration tab; then, in the navigation tree, expand the Data icon, and highlight the Database Settings node. Select the LDBM Plug-in Settings tab in the right pane. This tab contains the database attributes for all databases stored on this server. In the Maximum Cache Size field, enter a value corresponding to the amount of memory to make available for all databases. This value is for the total of the entire backend, meaning all databases cumulatively rather than the amount per single database instance. In the Look-Through Limit field, enter the maximum number of entries for the server to check in response to a search request. There are two ways to set the amount of memory in bytes to make available for import. The default is to have auto cache sizing, meaning 50% of the free memory is allocated for the import cache. It is also possible to set the import cache size manually by deselecting the Use Cache Auto-Size check box and then setting the value in the Import Cache Size field. For creating a very large database from LDIF, set this attribute as large as possible, depending on the memory available on the machine. The larger this parameter, the faster the database is created. Setting this value too high can cause import failures because of a lack of memory. The cn=config entry in the simple, flat dse.ldif configuration file is not stored in the same highly scalable database as regular entries. As a result, if many entries, particularly entries that are likely to be updated frequently, are stored under cn=config, performance will probably suffer. Although Red Hat recommends that simple user entries not be stored under cn=config for performance reasons, it can be useful to store special user entries such as the Directory Manager entry or replication manager (supplier bind DN) entry under cn=config since this centralizes configuration information. Every Directory Server contains a transaction log which writes operations for all the databases it manages. Whenever a directory database operation such as a modify is performed, the server creates a single database transaction for all of the database operations invoked as a result of that LDAP operation. This includes both updating the entry data in the entry index file and updating all of the attribute indexes. If all of the operations succeed, the server commits the transaction, writes the operations to the transaction log, and verifies that the entire transaction is written to disk. If any of these operations fail, the server rolls back the transaction, and all of the operations are discarded. This all-or-nothing approach in the server guarantees that an update operation is atomic. Either the entire operation succeeds permanently and irrevocably, or it fails. Periodically, the Directory Server (through internal housekeeping threads) flushes the contents of the transaction logs to the actual database index files and checks if the transaction logs require trimming. If the server experiences a failure, such as a power outage, and shuts down abnormally, the information about recent directory changes is still saved by the transaction log. When the server restarts, the directory automatically detects the error condition and uses the database transaction log to recover the database. Although database transaction logging and database recovery are automatic processes that require no intervention, it can be advisable to tune some of the database transaction logging attributes to optimize performance. The transaction logging attributes are provided only for system modifications and diagnostics. These settings should be changed only with the guidance of Red Hat Technical Support. Setting these attributes and other configuration attributes inconsistently may cause the directory to be unstable. To achieve higher performance, store the directory server databases and transaction log on a fast drive, such as an SSD. Update the /etc/fstab file to mount the /dev/sdb1 partition automatically to /var/lib/dirsrv/slapd-instance_name/db/ when the system boots. For details, see the corresponding section in the Red Hat System Administrator's Guide. At regular intervals, the Directory Server writes operations logged in the transaction log to the database index files and logs a checkpoint entry in the database transaction log. By indicating which changes have already been written to the database indexes, checkpoint entries indicate where to begin recovery from the transaction log, thus speeding up the recovery process. By default, the Directory Server is set up to send a checkpoint entry to the database transaction log every 60 seconds. Increasing the checkpoint interval may increase the performance of directory write operations. However, increasing the checkpoint interval may also increase the amount of time required to recover directory databases after a disorderly shutdown and require more disk space due to large database transaction log files. Therefore, only modify this attribute if you are familiar with database optimization and can fully assess the effect of the change. To modify the checkpoint interval while the server is running, use the ldapmodify command-line utility to add the nsslapd-db-checkpoint-interval attribute to the cn=config,cn=ldbm database,cn=plugins,cn=config entry. For more information on the syntax of the nsslapd-db-checkpoint-interval attribute, see the Red Hat Directory Server Configuration, Command, and File Reference. Durable transaction logging means that each LDAP update operation, comprised of a sequence of database operations in a transaction, is physically written to disk. Even though each LDAP operation can be comprised of multiple database operations, each LDAP operation is treated as a single database transation. Each LDAP operation is both atomic and durable. Turning off durable transactions can improve Directory Server write performance at the risk of data loss. When durable transaction logging is disabled, every directory database operation is written to the database transaction log file but may not be physically written to disk immediately. If a directory change was written to the logical database transaction log file but not physically written to disk at the time of a system crash, the change cannot be recovered. When durable transactions are disabled, the recovered database is consistent but does not reflect the results of any LDAP write operations that completed just before the system crash. Use the ldapmodify command-line utility to add the nsslapd-db-durable-transactions attribute to the cn=config,cn=ldbm database,cn=plugins,cn=config entry, and set the value of this attribute to off. For information on the syntax of the nsslapd-db-durable-transactions attribute, see the Red Hat Directory Server Configuration, Command, and File Reference. To improve update performance when full transaction durability is not required, use the nsslapd-db-transaction-batch-val attribute to specify how many transactions will be batched before being committed to the transaction log. Setting this attribute to a value of greater than 0 causes the server to delay committing transactions until the number of queued transactions is equal to the attribute value. This is similar to disabling durable transaction logging (in the nsslapd-db-durable-transaction attribute), but setting the batch value gives more control over how many transactions can be potentially lost. To specify or modify transaction batching while the server is running, use the ldapmodify command-line utility to add the nsslapd-db-transaction-batch-val attribute to the cn=config,cn=ldbm database,cn=plugins,cn=config entry. For more information on the syntax and values of the nsslapd-db-transaction-batch-val attribute, see the Red Hat Directory Server Configuration, Command, and File Reference. The Entry cache, which contains individual directory entries. The DN cache is used to associate DNs and RDNs with entries. The Database cache, which contains the database index files *.db and *.db4 files. For the highest performance improvements, all cache sizes must be able to store all of their records. If you do not use the recommended auto-sizing feature and have not enough RAM available, assign free memory to the caches in the previously shown order. Directory Server can automatically determine the optimized size for the database and entry cache. In instances created using Directory Server 10.1.1 or later, auto-sizing is enabled by default. Auto-sizing optimizes the size of both caches based on the hardware resources of the server when the instance starts. If you upgraded from a version earier than 10.1.1 or if you manually set a database or entry cache size, re-enable auto-sizing for optimized performance. For details, see Section 6.1.1, “Manually Re-enabling the Database and Entry Cache Auto-sizing”. Red Hat recommends to use the auto-tuning settings. Do not set the entry cache size manually. If you upgraded the instance from a version prior to 10.1.1, or previously manually set an entry cache size, you can enable the auto-tuning for the entry cache. For both the database and entry cache, if the nsslapd-cache-autosize parameter is set to a value greater than 0. For the database cache, if the nsslapd-cache-autosize and nsslapd-dbcachesize parameters are set to 0. For the entry cache, if the nsslapd-cache-autosize and nsslapd-cachememsize parameters are set to 0. The value sets the percentage of RAM that is used for the database cache. The remaining percentage is used for the entry cache. More than 512 MB RAM database cache do not improve the performance. Therefore, the database cache is limited to 512 MB. the nsslapd-dbcachesize in the cn=config,cn=ldbm database,cn=plugins,cn=config entry to 0 to enable the auto-sized database cache. the nsslapd-cachememsize in the cn=database_name,cn=ldbm database,cn=plugins,cn=config entry to 0 to enable the auto-sized entry cache for a database. Directory Server uses the remaining 60% of free memory for the entry cache. Using these settings, 10% of the system's free RAM is used (nsslapd-cache-autosize). From this memory, 40% are used for the database cache (nsslapd-cache-autosize-split) and the remaining 60% for the entry cache. [a] Directory Server applies the 512 MB limit for the nsslapd-dbcachesize parameter. The dbmon.sh script enables you to monitor cache statistics at runtime and continuously outputs the statistics. To terminate the script, press the Ctrl+C key combination. The dbmon.sh requires you to pass the options as environment variables to the script. For further details see the Directory Server Configuration, Command, and File Reference. If your caches are sufficiently sized, the number returned by the previous command matches the value in the count column of the dbmon.sh script's output. Additionally, if all of the entries and DNs fit within their respective caches, the userroot:ent count value matches the userroot:dn count value. However, to operate efficiently, at least 15% free database cache is required. To determine the optimal size of the database cache, calculate the sizes of all *.db and *.db4 files in the /var/lib/dirsrv/slapd-instance_name/db/ directory including subdirectories and the changelog database, and add 12% for overhead. To set the database cache, see Section 6.5, “Setting the Database Cache Size”. The DN cache of the database contains 100000 records. 69,8% of the cache is free. Based on the count value and the bytes used, each DN in memory requires 130 bytes on average. To set the DN cache, see Section 6.5, “Setting the Database Cache Size”. The entry cache contains in this database 50000 records and only 2 Kilobytes of free space are left. To enable Directory Server to cache all 100000 DNs, reported by the dbscan utility's output, the cache must be increased to minimum of 856 Megabytes (100000 DNs * 8972,7 bytes average entry size). However, it is recommended to round the minimum required size to the next highest Gigabyte and double the result. In this example, the entry cache should be set to 2 Gigabytes. To set the entry cache, see Section 6.3, “Setting the Entry Cache Size”. The entry cache is used to store directory entries that are used during search and read operations. Setting the entry cache to a size that enables the Directory Server to store all records has the highest performance impact on search operations. If entry caching is not configured, Directory Server reads the entry from the id2entry.db database file and converts the DNs from the on-disk format to the in-memory format. Entries that are stored in the cache enable the server to skip the disk I/O and conversion steps. Instead of manually setting the entry cache size Red Hat recommends the auto-sizing feature for optimized settings based on the hardware resources. For details, see Section 6.1.1, “Manually Re-enabling the Database and Entry Cache Auto-sizing”. Start the Directory Server Console. Select the Configuration tab and, in the navigation tree, expand the Data icon. Expand the suffix associated with the database, such as dc=example,dc=com, and then select the database. The entryrdn index is used to associate DNs and RDNs with entries. It enables the server to efficiently perform subtree rename, entry move, and moddn operations. The DN cache is used to cache the in-memory representation of the entryrdn index to avoid expensive file I/O and transformation operations. For best performance, especially with but not limited to entry rename and move operations, set the DN cache to a size that enables Directory Server to cache all DNs in the database. If a DN is not stored in the cache, Directory Server reads the DN from the entryrdn.db index database file and converts the DNs from the on-disk format to the in-memory format. DNs that are stored in the cache enable the server to skip the disk I/O and conversion steps. The database cache contains the Berkeley database index files for the database, meaning all of the *.db and other files used for attribute indexing by the database. This value is passed to the Berkeley DB API function set_cachesize(). This cache size has less of an impact on Directory Server performance than the entry cache size, but if there is available RAM after the entry cache size is set, increase the amount of memory allocated to the database cache. The operating system also has a file system cache which may compete with the database cache for RAM usage. Refer to the operating system documentation to find information on file system cache settings and monitoring the file system cache. Select the Database Settings entry. In the LMDB Plug-in Settings tab, fill the Maximum cache size field and select the unit. a value that is not a number. a value that is too big for a 32-bit signed integer (2147483647) on a 32-bit system. a value that is too big for a 64-bit signed integer (9223372036854775807) on a 64-bit system. If the nsslapd-db-home-directory attribute does not exist, add it with the new value to the cn=config,cn=ldbm database,cn=plugins,cn=config entry. When the database cache is stored on a RAM disk, Directory Server needs to recreate it after each reboot. As a consequence, the service start and initial operations are slower until the cache is recreated. The number of threads Directory Server uses to handle simultaneous connections affects the performance of the server. For example, if all threads are busy handling time-consuming tasks (such as add operations), new incoming connections are queued until a free thread can process the request. If the server provides a low number of CPU threads, configuring a higher number of threads can increase the performance. However, on a server with many CPU threads, setting a too high value does not further increase the performance. In instances created using Directory Server 10.1.1 or later, the number of threads Directory Server creates is calculated automatically by default. This number is based on the hardware resources of the server when the instance starts. If you upgraded from a version earier than 10.1.1 or if you manually set the number of threads, re-enable auto-sizing for optimized performance. For details, see Section 7.1, “Enabling Automatic Thread Tuning”. Red Hat recommends to use the auto-tuning settings. Do not set the number of threads manually. [a] The recommended maximum number of threads is applied. If you enabled the automatic setting, the nsslapd-threadnumber parameter shows the calculated number of threads while Directory Server is running. If the number of hardware threads changes, for example, because you increased the CPU cores of the virtual machine that runs the Directory Server instance, you must manually update this setting. To use the optimized and automatic setting, see Section 7.1, “Enabling Automatic Thread Tuning”. The 60 second default value is ideal for most environments. A value set too high or too low can have a negative impact on the replication performance. If the value is set too low, replication servers are constantly reacquiring one another and servers are not able to send many updates. In a high-traffic replication environment, a longer timeout can improve situations where one master exclusively accesses a replica. However, in most cases, a value higher than 120 seconds slows down replication. Database link performance can be improved through changes to the Directory Server's connection and thread management. Each database link maintains a pool of connections to a remote server. The connections to optimize resources can be configured for the directory. Select the Configuration tab, expand the Data folder in the left pane, and select the suffix, then the database link to change. Click the Limits and Controls tab in the right navigation pane. Maximum TCP connection(s). The maximum number of TCP connections that the database link establishes with the remote server. The default value is 3 connections. Bind timeout. Amount of time, in seconds, before the database link's bind attempt times out. The default value is 15 seconds. Maximum binds per connection. Maximum number of outstanding bind operations per TCP connection. The default value is 10 outstanding bind operations per connection. Time out before abandon (sec). Number of seconds before the server checks to see if a timed-out connection should be abandoned. The default value is 1 second. Maximum LDAP connection(s). Maximum number of LDAP connections that the database link establishes with the remote server. The default value is 10 connections. Maximum bind retries. Number of times a database link attempts to bind to the remote server. A value of 0 indicates that the database link will try to bind only once. The default value is 3 attempts. Maximum operations per connection. Maximum number of outstanding operations per LDAP connection. The default value is 2 operations per connection. Connection lifetime (sec). How long a connection made between the database link and remote server remains open. Connections between the database link and the remote server can be kept open for an unspecified time or closed after a specific period of time. It is faster to keep the connections open, but it uses more resources. For slow connections, it may be desirable to limit the connection time. A value of 0 indicates there is no limit. By default, the value is set to 0. Use ldapmodify to add connection attributes to the database link entry. The connection management attributes specified in this entry take precedence over the attributes specified in the cn=default instance config entry. nsOperationConnectionsLimit Maximum number of LDAP connections that the database link establishes with the remote server. The default value is 20 connections per database link instance. nsBindConnectionsLimit Maximum number of TCP connections that the database link establishes with the remote server. The default value is 3 connections. nsConcurrentOperationsLimit Maximum number of outstanding operations per LDAP connection. The default value is 2 operations per connection. nsConcurrentBindLimit Maximum number of outstanding bind operations per TCP connection. The default value is 10 outstanding bind operations. nsBindRetryLimit Number of times a database link attempts to bind to the remote server. A value of zero (0) indicates that the database link will try to bind only once. The default value is 3 attempts. nsConnectionLife Connection lifetime, in seconds. Connections between the database link and the remote server can be kept open for an unspecified time or closed after a specific period of time. It is faster to keep the connections open, but it uses more resources. For example, it may be wise to limit the connection time for a slow connection. A value of 0 indicates there is no limit. By default, the value is set to 0. When the value is 0 and there is a list of failover servers in the nsFarmServerURL attribute, the first server is never contacted after failover to the alternate server. The default value is 0 seconds. nsBindTimeout Amount of time, in seconds, before the bind attempt times out. The default value is 15 seconds. nsAbandonedSearchCheckInterval Number of seconds that pass before the server checks for abandoned operations. The default value is 1 second. Protect server performance by detecting errors during the normal chaining operation between the database link and the remote server. The database link has two attributes — nsMaxResponseDelay and nsMaxTestResponseDelay — which work together to determine if the remote server is no longer responding. The first attribute, nsMaxResponseDelay, sets a maximum duration for an LDAP operation to complete. If the operation takes more than the amount of time specified in this attribute, the database link's server suspects that the remote server is no longer online. Once the nsMaxResponseDelay period has been met, the database link pings the remote server. During the ping, the database link issues another LDAP request, a simple search request for an object that does not exist in the remote server. The duration of the ping is set using the nsMaxTestResponseDelay. If the remote server does not respond before the nsMaxTestResponseDelay period has passed, then an error is returned, and the connection is flagged as down. All connections between the database link and remote server will be blocked for 30 seconds, protecting the server from a performance degradation. After 30 seconds, operation requests made by the database link to the remote server continue as normal. nsMaxResponseDelay Maximum amount of time it can take a remote server to respond to an LDAP operation request made by a database link before an error is suspected. This period is given in seconds. The default delay period is 60 seconds. Once this delay period has been met, the database link tests the connection with the remote server. nsMaxTestResponseDelay Duration of the test issued by the database link to check whether the remote server is responding. If a response from the remote server is not returned before this period has passed, the database link assumes the remote server is down, and the connection is not used for subsequent operations. This period is given in seconds. The default test response delay period is 15 seconds. Very large entry sizes or a large number of entries can negatively impact server performance during import operations. Both Directory Server settings and operationg system settings can be tuned to improve performance for imports. The nsslapd-cachememsize attribute defines the size allowed for the entry cache. The import buffer is automatically set to 80% of the cache memory size setting. If the memory cache is 1GB, for example, then the import buffer is 800MB. When importing a very large database or entries with large attributes (often with values like binary data like certificate chains, CRLs, or images), then set the nsslapd-cachememsize attribute high enough so that the import buffer has enough memory to process the entries. When there are a large number of entries to be imported, the operating system itself may hit performance limits on what it allows the Directory Server to do. This is particularly true on x86 systems. This can cause import operations to fail because of resource constraints. If necessary, set the system ulimit value to the maximum number of allows processes for the system user. Then run the import operation. 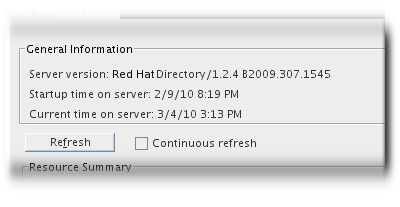 Note that revision numbers relate to the edition of this manual, not to version numbers of Red Hat Directory Server. Red Hat Directory Server 10.3 release of the guide. For version 10.2: Removed the Optimizing System Performance section. Added the Moving the Database Directory to a Separate Disk or Partition section. For version 10.1.1: Described database cache, entry cache, and number of threads auto-tuning. Added dbmon.sh description. Added "Tuning the Replication Performance" chapter. Updated Resetting the Host Machine's File Descriptors section. Red Hat Directory Server 10.1 release of the guide. Add information to avoid using owner nobody:nobody. Red Hat Directory Server 10 release of the guide.